Today is the start of something new! Something that I hope you will find exciting and interesting. Twelve food bloggers have joined forces to bring you a virtual “progressive dinner.” The virtual progressive dinner was the brainchild of my blogging friend, Barb, from Creative Culinary, who has organized the effort and is keeping us all on track. Bless her. Our plan is to hold a progressive dinner once a month with a different theme and host for each. The host chooses the theme for the party and makes the main dish. The other participants create all the sides, beverages, and desserts. Maybe you’re wondering “what the heck is a ‘progressive dinner? '” Well, progressive dinners have been around for quite some time. I remember my parents doing them back in the 60’s and 70’s and I did them myself later on. It’s a dinner party with each individual course prepared at a different participant’s home. You’d start with drinks at one home, then “progress” to the next home for appetizers, then on to the next for the main course, and so forth. The evening would end with dessert (and maybe more drinks) at the final person’s home. Sound like fun? We think so! So we’re bringing it to you virtually. And it’s my privilege to be the host for the very first get together. For this month’s theme I chose “Summer in the South” – what else? And the entree I’ve chosen to cook for you is a southern classic – Creole Style Smothered Chicken. It’s a whole butterflied chicken cooked in a skillet under weights with a creole sauce. I do hope you enjoy it. And please be sure to “progress” through to each of the other participating blogs to experience all the other courses. Choose a skillet large enough to hold the butterflied chicken without crowding, preferably a well-seasoned black iron skillet. The one pictured is a 12-inch. Lightly season both sides of a butterflied (or spatchcocked) chicken with salt and pepper. If you’re not sure how to butterfly or spatchcock a chicken, see my last post here. Melt the butter in the skillet over medium heat, then add the chicken skin side down. Cover the chicken with a heavy plate or a smaller skillet that will fit inside the cooking skillet (I’m using a 10-inch smaller skillet in the photo). 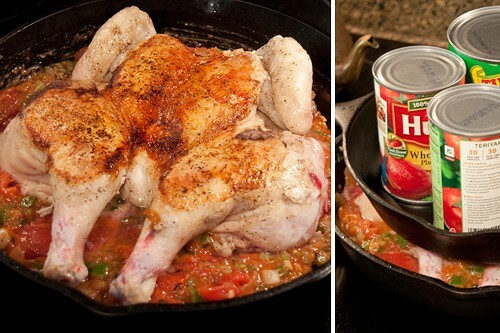 Weight the plate or skillet with several heavy cans. You need about 5 pounds of weight. Reduce the heat to low and cook for about 25 minutes or until the skin is nicely browned. 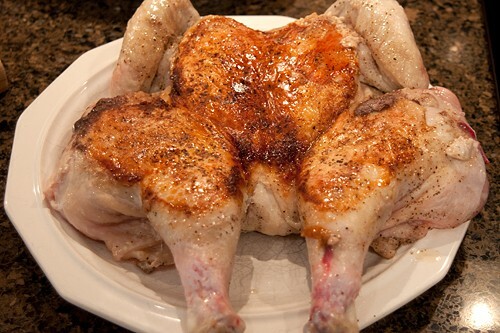 When the chicken has browned, remove it to a plate and set aside. 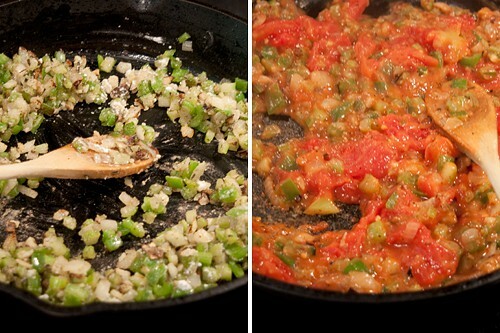 Without cleaning the skillet, add the onion, celery, green pepper, garlic, salt, black pepper, and thyme. Cook, stirring, until the vegetables are wilted. Sprinkle with flour and stir until well blended. Add the tomatoes with their juice. Increase the heat and bring the mixture to a boil. Return the chicken to the pan with the browned side up on top of the sauce. Reduce the heat to medium-low. Cover with the plate or smaller skillet and weights. Cook for about 45 minutes or until the chicken reaches an internal temperature of 160F. Remove the chicken to a serving platter. Increase the heat slightly and cook the sauce briefly until thickened. Pour the sauce over the chicken and sprinkle with the chopped green onions. Brown, succulent chicken simmered with a Creole sauce. Choose a skillet large enough to hold the butterflied chicken without crowding. A well-seasoned black iron skillet is preferable. Lightly season both sides of the chicken with salt and pepper. Melt the butter in the skillet over medium heat. Add the chicken, skin side down. 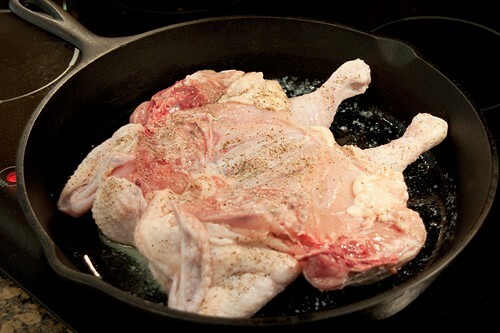 Cover the chicken with a plate or a smaller skillet that will fit inside the cooking skillet. 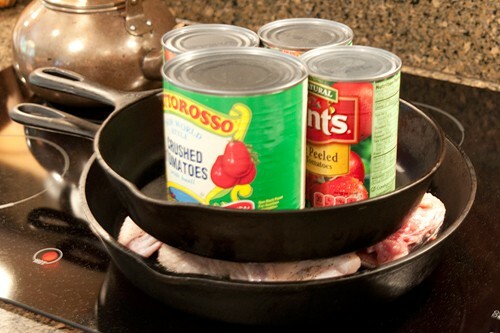 Weight the plate or skillet with several cans. Reduce the heat to low and cook for about 25 minutes or until the skin is nicely browned. Remove the chicken to a plate and set aside. Without cleaning the skillet, add the onion, celery, green pepper, garlic, salt, black pepper, and thyme and cook, stirring, until the vegetables are wilted. Sprinkle with flour and stir until well blended. Add the tomatoes with their juice, increase the heat and bring the mixture to a boil. Return the chicken, browned side up, on top of the sauce. Reduce the heat to medium-low, cover with the plate or smaller skillet and weights. Cook for about 45 minutes or until the chicken reaches and internal temperature of 160F. 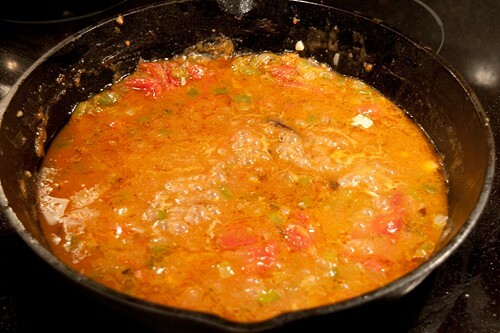 A classic southern recipe, the origins of which are obscure. This version is based on Craig Claiborne’s recipe in Craig Claiborne’s Southern Cooking. Thanks, Sues! We all really enjoyed putting it together. Oh. My. Goodness. I cannot WAIT to dive into this and make it for The Artist! Lana, you have certainly come up with the penultimate main course for our Southern Progressive Supper. Brava! It’s definitely a southern classic and I was happy to present it for the first in our new series! Lana, thanks so much for hosting this terrific Southern dinner today! Your smothered chicken sounds spectacular…and will have to give it a try once the weather cools down! It was my pleasure to host, Liz. I hope you’ll try the recipe and enjoy it. Chicken never looked more delicious! Love the gorgeous color of the sauce. I always love a Creole sauce, Barbara. So delicious and pretty, too. Thanks, Jenni! And you’re right – that sauce is just luscious. Oh this chicken Creole is fantastic! And I love your cooking method and want to try it all! Wow this looks so delicious! Thanks for a first great theme, Lana! You’re welcome, Jamie, and thanks to everyone for allowing me to host. I’m off now to read your post and save the recipe for your spectacular salad! Love, love, love this idea!! And love that chicken recipe!! Ready to go for a swim in that sauce right now!! YUM!! This sounds fantastic. I love all the flavors in the sauce. Thanks for being our first host! I was very pleased to host the first of our fun progressive dinners, Megan! Gosh, I love love love the idea of a progressive dinner but in the land of the Internet and Food Blogs…genius idea! 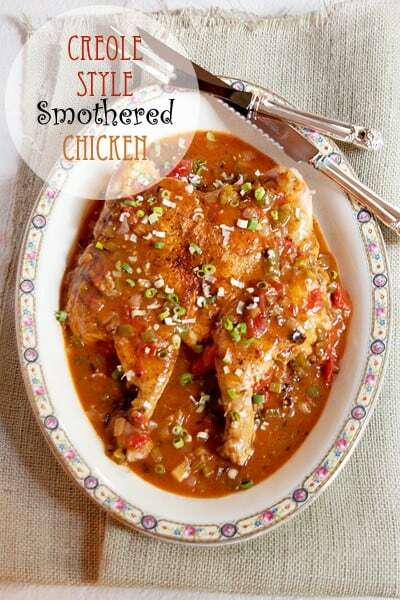 This smothered chicken looks downright sinful! We really enjoyed doing the progressive dinner, Mallory, and are already looking forward to next month’s! Hope you keep following along. I knew I could count on you Lana…something beautiful and delicious and yet a bit unexpected. Sounds totally wonderful and I can’t wait to try it! It’s one of my favorite old, classic, southern recipes, Barb, and I am very happy to share it with others through our new progressive dinners series. I’m on my way over to your blog to see the recipe for that delicious creamed corn! I can’t wait to try this recipe. Thank you for coming up with this theme. It has opened a world of endless delicious possibilities for me. I am learning a lot about Southern food. I’m very happy to introduce you to just one little aspect of southern food, Ansh. We have so many different cuisines in the south and all of them are interesting. Creole is one of my favorites. I love doing butterflied chicken on the grill, but I haven’t done it in a skillet. And that sauce looks fantastic. Need to try this! Doing it in a skillet is really easy, Julie. I hope you’ll give it a try. This sounds wonderful and will definitely try some of it. But I’m having a problem getting the recipe for the Soup. The page comes up very narrow and almost impossible to read- is it just me? I’m not having any problem accessing Spiceroots’ page with the Maque Choux Soup, Vicki. Thanks so much for hosting this month and introducing me to Southern food! I had no idea what to expect with this chicken, but it looks so amazing! I’m always happy to introduce people to or amazing southern cuisine, Lauren. And – your watermelon lemonade was the perfect complimentary beverage for this menu! I love the whole virtual progressive dinner idea. Your main course sounds amazing, Lana. Love the sound of that creole sauce. Thanks, Renee! We all had such fun putting on this progressive dinner. I’m already looking forward to next month. This looks incredible! I’ve actually never had anything like this. Thanks for hosting! It’s definitely a southern classic, Milisa. I hope you’ll give it a try sometime! What a fun dinner party. I pinned several of the choices. This chicken dish is the highlight of the bunch as far as I am concerned.